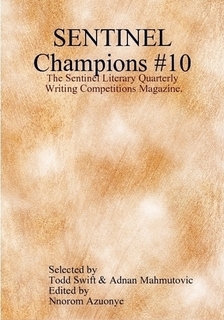 Features the winners and commended poems and short stories from the Sentinel Literary Quarterly Poetry and Short Story Competitions (October 2011) judged by Todd Swift and Adnan Mahmutovic respectively. Nick Taylor - 'Atlantis', GB Clarkson - 'Losing the Termagant', Sharlene Teo - 'Post', David Paul Jones - 'Valentine Gift', 'Nature Walk'. Andrew Campbell-Kearsey - 'Third Time Lucky', Nancy Cook - 'Maggie Kelly's Gift', Jane Moreton - 'Going Quietly', and Martin Cathcart Frödén - 'Cztery miesiące / Four months'. Plus competition adjudication reports by the judges. BUY A COPY OF SENTINEL CHAMPIONS #1O. All contributors are entitled to 1 free copy of the magazine. EBook (PDF) E-mail delivery = £1.49. These issues are in stock and shipping. Click on cover image or link to learn more about each issue to buy. 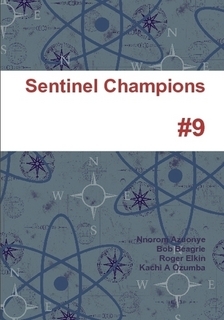 ©2010-2012 Sentinel Champions/Sentinel Poetry Movement.